Seed and chemical companies have developed two major technologies to avoid crop injury from soil- and foliar-applied herbicides: genetically modified herbicide-tolerant crops; and safeners, chemicals that selectively—and mysteriously—protect certain crops from damage. 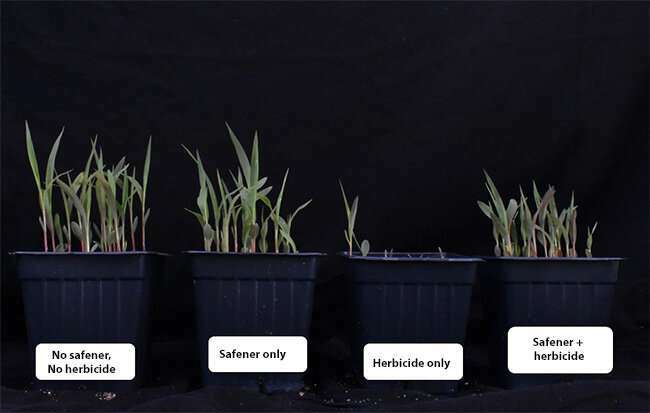 In a new University of Illinois study, researchers identify genes and metabolic pathways responsible for safener efficacy in grain sorghum. "This link to dhurrin was kind of a clue—maybe the safener is tapping into a chemical defense pathway the plant is already using to protect itself," Riechers says. "This is a new concept no one has ever proposed before in sorghum. It's giving us some insight why the safener might be eliciting this response in the plant." The article, "Transcriptome profiling and genome-wide association studies reveal GSTs and other defense genes involved in multiple signaling pathways induced by herbicide safener in grain sorghum," is published in Frontiers in Plant Science.